The nest is empty. Again. My daughter moved back home from New York last September, about two years after graduating college. It was a temporary although open-ended move: She wanted to live rent-free while applying for artist residencies in Germany. I had trepidations. I write at home and rely on an empty house free of distractions. Since leaving my job last January, I’d chugged along with the first draft of my novel as steadily as a railway worker laying track. I was worried that having her around would mess that up. But home she came. And mostly – 90 percent – it was great. This was the first time she’d lived with us for an extended period since high school. And delightfully she was no longer a high school student! None of the surly, oppositional stance of a teenager. She was funny, talkative, interested in doing stuff with us, and good about keeping the kitchen clean and confining her mess to her own room. She cooked (excellent) dinners. She made progress on the work goals she’d set for herself – the residency applications, creating a portfolio web site, doing her creative projects etc. We were both working at home. All day, every day. This was more time than we have spent in each other’s presence since her first year of life, when I was on maternity leave and she hadn’t yet started day care! My preferred routine is to get up early, go to the gym around 7 a.m., and be on my computer by 9 or 9:30. Meanwhile she’d be in bed with the cat until 11:30. It drove me nuts. Was she working? Was she watching YouTube videos? Everything she did seemed to take much longer than it would take me. I flailed around in the swamp between Trust and Verify. I tried not to constantly ask, “SO? What are you working on? Have you finished your ______?” but I did end up asking that a lot, which probably drove her nuts too. There were pleasant distractions as well as irritating ones. She’d ask me to accompany her shopping, and of course I’d say yes. She’d want to go to the gym mid-day and I’d do that with her, even though it broke up my writing momentum. I don’t regret those interruptions – she’s only here for a short while, enjoy the time with her– but it meant I often felt less productive than I like. There’s a kind of a worry sub-routine that runs under the other programs of my brain when she’s living with us. I suspect this is true for many parents, particularly mothers: It’s 11 p.m., is she still out with her friends? Did she write that thank-you note to her great-aunt yet? Has she made a dentist appointment? When she was living 3,000 miles away, that sub-routine shut off. I didn’t know or care where she was at 11 p.m. I assumed she would manage her life, and she did. But then she moved home, and the sub-routine kicked back in. Unnecessary, vestigial, irrational, but there it was — stressful and distracting for me, and annoying for her. Spending so much time around each other reminded me of when she was an infant. We’d be home together all day, skin against skin, nursing and fussing and nursing and fussing, and sometimes by 5 p.m. I felt like we couldn’t stand to touch each other any more. Thankfully that was when Sam would show up, fresh and calm, and I could hand her off. In any event, when she was accepted into a three-month residency program in Berlin, I was thrilled. It’s a great opportunity for her, it will allow me to reenter my lovely hermitlike work mode, and it will also give us some distance from each other. Good for everyone! By last week, I was eagerly counting the days until her flight and looking forward to having time alone with Sam again. But then in the past few days, I started to feel separation anxiety. Was she packing everything she’ll need? Does she know what to do if someone follows her in the street? Does she have dental floss? I wanted to hover but she wanted to be left alone. I felt rejected and jagged and weepy. Just like when we dropped her off at college six and a half years ago. Get all this off my chest. What happens to family traditions when your family goes away? Well, “family goes away” might be stating things a bit too strongly. But this is our first winter with our daughter away in college, and holidays feel different when there is no child in the house. Even if for the past couple of years that “child” was a big, independent, less-than-optimally-communicative teenager. Take Chanukah, which arrives this weekend with its usual single-candle blaze of glory. Normally we would make a Big Deal of the first night of Chanukah — festive dinner with relatives or friends, lots of presents, latkes, chocolate gelt, dreidels. Most years we would end up making latkes on two or three different evenings for different configurations of friends and guests. And we always made sure to buy at least eight gifts, and we had big gift-opening hoopla every night. This year? I do not want to cook a single latke. I will be completely fine if I don’t eat a single latke. Okay, I’ll eat some when we get together with our chavurah in late December, but other than that…. meh. I don’t want to open gifts every night either. I’d like to open gifts on the last night, when Daughter will be home for her winter vacation. But other than that, I don’t really care. In one sense, this is completely reasonable. Chanukah is a minor holiday in Jewish tradition, which mushroomed out of its historic proportions in the past 50 years as American Jews tried to come up with a counterbalance to the glitter of Christmas. Lighting candles with a minimum of fuss is probably closer to the traditional Chanukah than what we’ve been doing in our household for the past 18 years. But there are other times when the issue is murkier. Take Shabbat. When Daughter was home, we lit candles and said blessings on most Friday nights where we were all home together. This fall, when Sam and I have been home on a Friday, it’s felt slightly weird lighting candles with just the two of us. Which raised the question… were we just lighting candles to educate our child? or were we doing it for us also? That question is more nuanced for me than it might be for some people because I was not raised with much Judaism at all. My family had a Passover seder and lit a menorah, but we never celebrated Shabbat or belonged to a synagogue. So the Jewish traditions I carry out are ones that I’ve consciously chosen as an adult, rather than ones I inhaled with my childhood air. But back to that Shabbat moment of to-light-or-not-to-light…. I skipped the white table cloth. But I lit the candles, even without Daughter. And there are really two reasons for that. One is that as adults, we need to take care of ourselves — regardless of whether we have kids around or not. I don’t want to be someone who lives on TV Dinners because there are no children to cook for. I don’t want to be that old lady who lets the house go uncleaned and unrepaired because she’s the only one living there. We need to nourish ourselves as well as our children. Shabbat is a kind of nourishment, like a home-cooked meal, an occasional massage, a bouquet of flowers from the farmer’s market. And that brings me to the second reason — I do want to keep Shabbat as a part of my life. I care about it and believe in it. So I lit. But clearly that’s not true for every Jewish tradition. Some are falling by the wayside. Building a Sukkah? We did it for about ten years when Daughter was little. Now? Forget it! Latkes? Can live without the oil, the mess and the calories. Shabbat? Big Passover Seder? Chanukah candle-lighting? Those are keepers. What about you? Any changes in your family rituals or traditions if you’ve had children leave home? And what does that say about your values and priorities? After putting up with a year of my anticipatory angst, you might be wondering, How’s it going with that Empty Nest? And after about two months I can answer… really well! 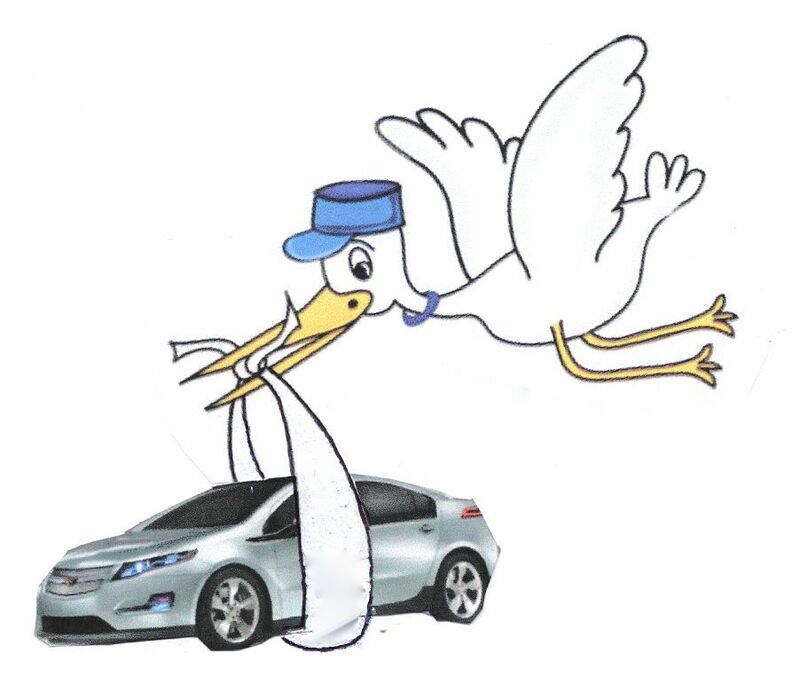 Got rid of the station wagon and bought the Chevy Volt (which I love – but more on that in a future post). Started taking an intense 90-minute bike/row class at the gym at 6 a.m. three days a week. Cooking more “adult” foods — bok choy, kale, chard, cauliflower. More free time on weekends — autumn without kid soccer games! — for birding, hiking etc. Ability to take a vacation in the middle of the fall, not on school schedules. The biggest change, though, is not a visible one. There’s an entire part of my brain that was tied down and now is suddenly free. It wasn’t taken up with major worries, just a constant drone of minor stuff — when will she be home from school, is she done with her homework, should she be going to bed, should she be waking up, what’s the status of the college applications, what are her plans for the weekend, etc. It felt like a computer with a DOS program running steadily behind Windows — you don’t see it, you don’t hear it, but it ties things up and makes everything run a little more clunkily. For eighteen years. And now suddenly it’s gone! Wow! 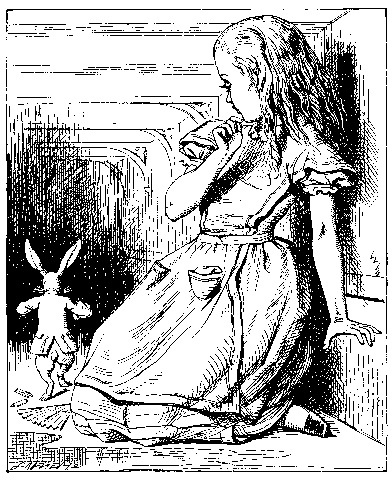 My marriage seems more intense, as if it had inflated, Alice-in-Wonderland style, to fill a room. I suddenly feel more dependent on Sam. We’ve gone from a household of three to a household of two. Before, if he went out of town overnight for work, Daughter was still around — most likely busy, or staying out late, or closed up in her room video-chatting, but still around for a good-night hug or requesting a lift to BART. Now when he is gone, there is no one but me and the cat. It’s a little unsettling to feel this dependent on him. For the past 18 years, our marriage has been intertwined with a huge, all-consuming Project — raising a child. Even when we went out for dinner by ourselves, this was always there at the table with us. Now suddenly the Project is gone. Returning to my computer analogies, imagine if the Apple workforce showed up one morning and were told they should keep on working, but they would no longer be manufacturing Macs or iPhones or iPads. You look around and think, Um, now what are we supposed to be doing? Why are we all here? I’m newly conscious that I don’t have that many strong, current, one-to-one friendships. I have a zillion Facebook friends, including some very old, very dear friends from my teenage years with whom I have marvelously reconnected via the Internet. I have blog readers. I have co-workers. I have people I see at synagogue. But I don’t have as many nearby, frequent, get-together-and-laugh-until you-pee female friends as I had in my teens and 20s and early 30s. Basically — confession time, a little post-Yom Kippur al cheit here — I let my own friendships slide when I became a Parent. I wanted to spend my free non-work time with Daughter and Sam. And we were constantly socializing in child-centered formations — school potlucks, soccer weekends, dinners with parents of Daughters’ friends. There were lots of people with whom I spent lots of time, but never really developed a meaningful individual relationship. We related through our children. And now those children and those potlucks and soccer weekends are gone. That just heightens the unsettling feeling of dependence on Sam. And you read those articles about aging and how people with close friendships stay healthier and live longer than those who are isolated. Aak! 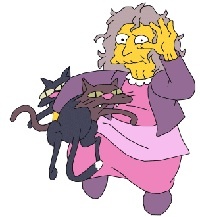 I don’t want to be an 80-year-old cat lady alone in her house. So resolved: I will put effort into reviving and cultivating individual friendships. Now, Sam and I are not going to fall apart. (Don’t worry, Dad!!) But there is subtle recalibration that needs to happen — even with all the positive changes, the freedom, the opportunities, and the knowledge that Daughter is happy and healthy and doing what she needs to do. I do need to add this as a postscript. The sense of freedom, of losing that DOS program of worry in the background of my brain, is only possible because Daughter is happy and doing well. The empty nest would be a completely different experience if it were empty because a child had gone AWOL, or was floundering or making dangerous choices. That isn’t our situation… fortunately. I thought I would cry when we said goodbye to Daughter in her dorm room, but I didn’t. Move-in day came after a week of visiting various family members back east. 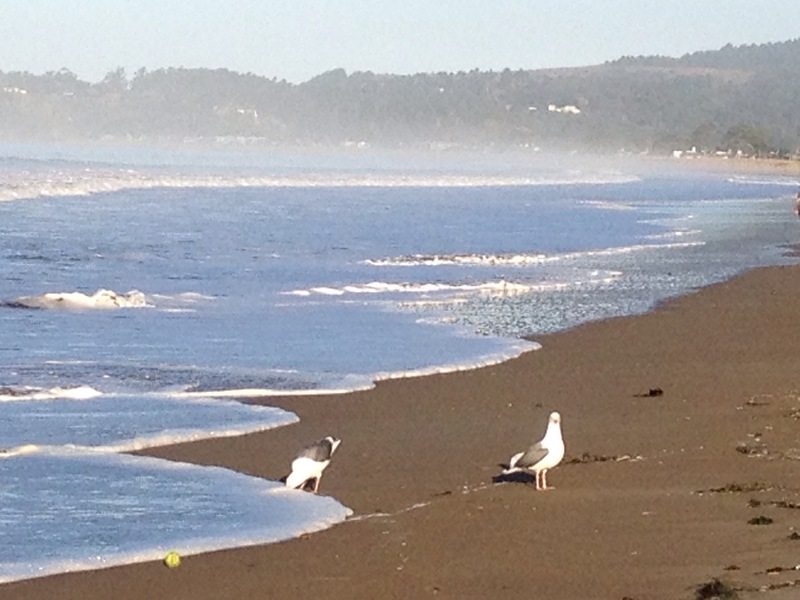 I love them all, but three different houses in nine days — two beach communities and one city — is a lot. Then there was the expedition to Ikea in New Jersey followed by two separate trips to a three-story Bed Bath & Beyond on the Upper East Side that made our little Oakland BB&B look like a malnourished Dickensian orphan. It was the biggest BB&B I’d ever seen. 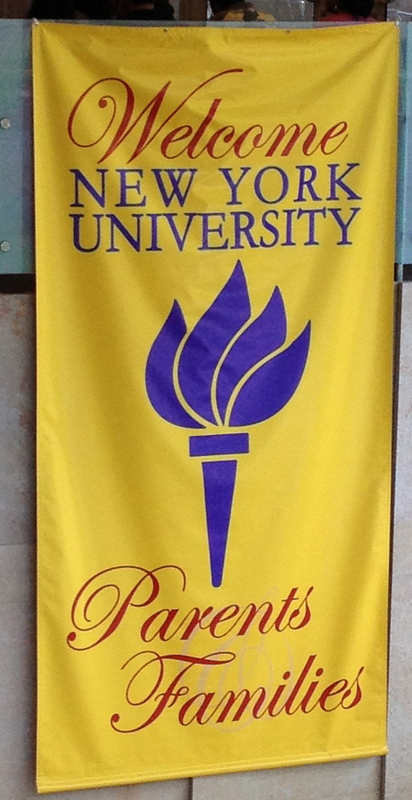 I’d never pictured taking a child to college in a taxi, but in true New York spirit, that’s what we did. 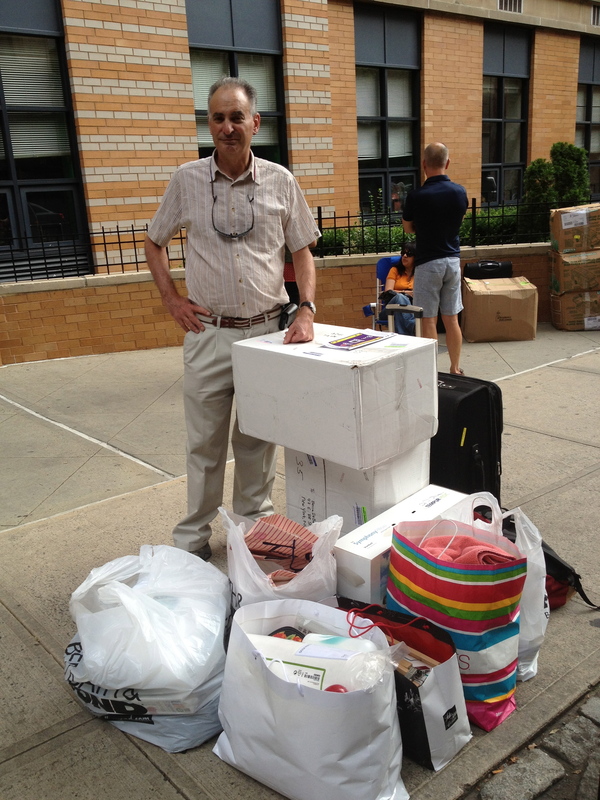 Sunday was move-in day not just for Daughter but for approximately 5,000 other NYU freshman. Considering the numbers, the university did an impressive job of organizing things and keeping order, with move-in times allotted by floor number and vast hordes of cheerful house elves – oops, I mean student volunteers — directing people where to go. But it still took three trips by elevator to get all Daughter’s stuff up to her 8th floor room, with a twenty-minute queue for each elevator trip, preceded by a queue to get her room keys, and followed by another queue in a building about eight blocks away to get her student ID. I had worried that Daughter was bringing too many clothes and would look like a spoiled princess to her roommates. But it quickly became apparent that her Everest of stuff was just an average mountain, or maybe even a foothill: We weren’t toting any microwaves, coffee makers, cross country ski poles, big screen TVs or wheeled duffels the size of Great Plains bison. But there was time to remedy our failings. NYU was running continuous shuttle buses from its various dorms to the nearest Bed Bath & Beyond (yes, the downtown mother ship). And these weren’t little vanlike shuttles – they were inter-city-size Greyhound style buses, the seats filled with freshmen families and the luggage compartments jammed with their BBB shopping bags. 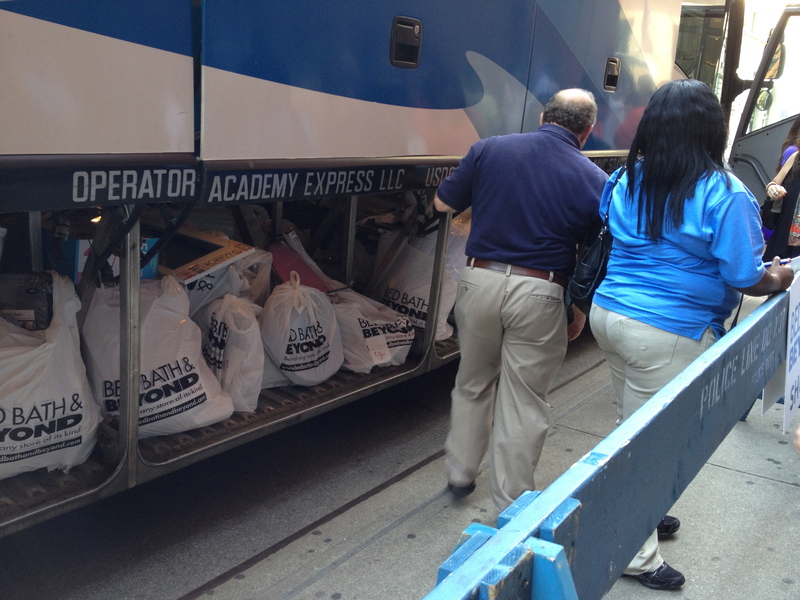 The buses turned out to be so crowded that we couldn’t get on, so we hopped another cab to get last-minute necessities like a shoe rack and a bin for under-bed storage. The BB&B was festooned with Welcome NYU Students banners, purple-and-white balloons and baskets of free candy; signs announced that it would stay open until midnight; employees had been drafted from corporate headquarters to help handle the swarm of parents and students. We scrambled for our merchandise and joined the columns of freshman families trekking across Greenwich Village with big plastic shopping bags of stuff. It felt like ants leaving a picnic. It felt like a middle-class looting spree. It was a vast, decentralized transfer of millions of cubic feet of housewares from Bed Bath & Beyond to 5,000 individual dorm rooms. It was the free market at work. It contributed to a bizarre day. So much frenetic motion, buying, schlepping. So much high emotion swirling through the throngs of parents and freshmen – 18-year-old excitement and nervousness, 50-year-old heartache and pride. Toasters and shoe racks became surrogates for care-taking: Our children will be on their own in the big scary world, but at least they will have buttered toast and orderly shoes. By the time we returned to Daughter’s dorm and assembled the shoe rack and filled the underbed storage bin and made one final shopping run to the Strand bookstore for old National Geographic magazines to decorate her room, all three of us were ready for Sam and me to leave. We were utterly exhausted. Daughter wanted to hang out with her roommates. We said a quick goodbye. We didn’t take a photo. I didn’t cry. (Sam did.) We retreated to a nearby gelato store and collapsed in a corner and devoured about 1,200 calories of creamy fortitude. My friend Ellen was dropping off her daughter at college over the weekend too, and wrote as her Facebook status, “Labor pains.” It’s an apt metaphor. I spent a lot of the past year anticipating this separation – thinking “this is our last soccer tournament,” “this is our last Halloween,” and so on. Just as my body took nine months to prepare for Daughter’s arrival, my mind was taking nine months to prepare for her departure. Then the past week felt like the end stages of pregnancy, when you are so physically uncomfortable that you just want the damn baby to arrive already. By Sunday, after a week of seeing relatives, Daughter was desperate to be around teenage peers. Sam and I were desperate for our own bed. Labor pains, yes, but also relief on both sides that move-in day was finally here. Now after a 3,000-mile plane ride we’re home, minus one child. Things are different but they’re not. It’s easy to imagine she’s simply away for a day or two: The house is quiet right now, but she’s out with friends and will be back late tonight. She’s at sleep-away camp for a week. She’s upstairs in her room with the door closed, happily ignoring us. But tonight after dinner, there was no one to unload the dishwasher, which had been her chore. I can’t count how many times over the past few years I had to badger her to unload the dishes, or growled at her sudden disappearance and grumpily unloaded them myself. But in fact, the vast majority of the time she did unload them. And it made household life a little bit easier. Sam and I looked at each other over the racks of clean dishes as it hit both of us: Now there is nobody except us to unload them. Not even anyone to badger or growl about. Chevy Volt (cool technology, green, cutting-edge but… AMERICAN??!). News flash: It’s a Volt! I spent the afternoon at the Chevy dealership yesterday and, after listening to more Classic Rock than I’ve heard in the past ten years combined, made my downpayment. It hasn’t come home with me yet. I asked the dealership to hold it until we return from taking Daughter to college. I couldn’t bear the idea of this shiny new car sitting unattended for ten days under the Icky Sap Tree in front of our house. Long before yesterday, the dare-I-buy-an-American-car question had become a non-issue. I went for a ride with one of my haircutter’s clients who LOVES her Volt. I heard about my neighbor’s friend who LOVES his Volt. Then, after I did my Volt-or-Prius blog post, I got a bunch of comments from complete strangers who don’t even live in the Bay Area but own Volts and LOVE their Volts. I started to think they should have named this car the Chevy Cult. In any case, there were enough rave comments flying around that I stopped worrying whether its American-ness meant that a Volt would be a poorly-made, piece-of-junk lemon. And I love the idea of not having to buy any gas. My daily commute is six miles round-trip. On weekend errands, I do maybe ten miles. So with the Volt able to travel 35 miles on a battery charge, I’ll be able to go for weeks — maybe months — without entering a gas station. I also want to support the development of better, more environmentally-friendly auto technologies in the U.S. A Prius is good on gas mileage and would have been cheaper, but I see my purchase as a personal vote for support for those people in Detroit who are trying to be forward-thinking. The future of our auto industry depends on this kind of ability to look ahead and innovate. 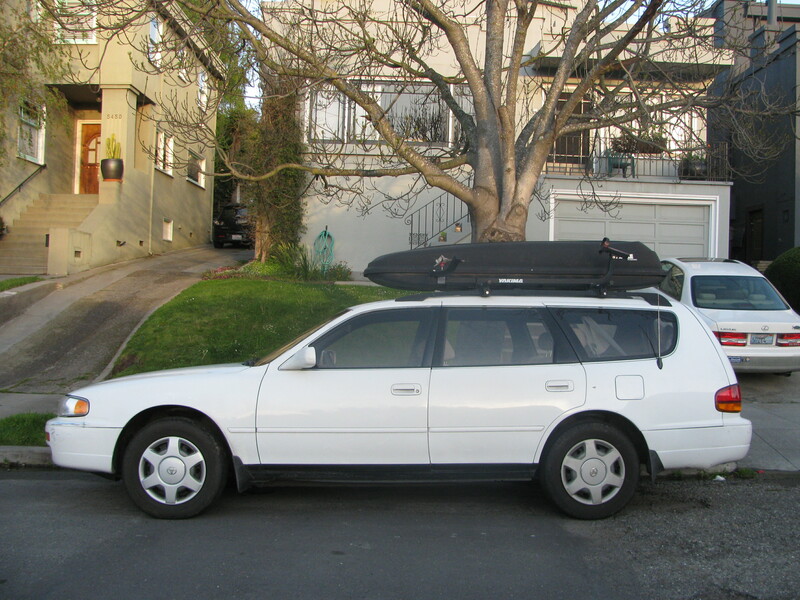 There was also a little shove of impetus last week when Daughter couldn’t get my 17-year-old station wagon to start. Between the missing hubcap, stolen radio, power steering fluid leak, anti-lock brake system trouble, crack in the windshield and now iffy starting, it was pretty much time to get off the dime and buy the new car. Or like the dashboard electronics that tell you how much air is in the tires. No more rolling around in the dirt of the gas station with a tire gauge! Now, just a couple of weeks until I pick it up and bring it home. Do midlife transitions get any more obvious than this? Day one: Leave child at college. Day two: Bring home new car. Maybe I should just park the darn thing in her bedroom. I’ll give it a couple of months and let you know if I become a card-carrying member of the Chevy Cult. With three weeks until C-Day, I’ve been thinking about how we’ll communicate with our daughter once she is away at College. With today’s broad range of technology and its equally broad range of parenting styles, the options are wide open. I know one couple who made an agreement with their son to talk by phone once a week. Well, more often than not, the appointed day of the week would pass without a call. Maybe two weeks would pass. Maybe three weeks. They’d call, not get answers. The mom was not, shall we say, pleased. Eventually their son did a study-abroad unit in the wilds of South America and they didn’t talk to him for months. Then I have another friend who texted with her daughter multiple times a day. This was mutual, not just a hovering helicopter mom. Daughter would text mom on a regular basis about her classes, how she was feeling, whether to buy the grey or blue sweater, etc. I’ve been trying to recall how I communicated with my parents in college, and can’t remember anything at all. This was long before the era of cell phones and texting, so it would have been by land line or snail mail. 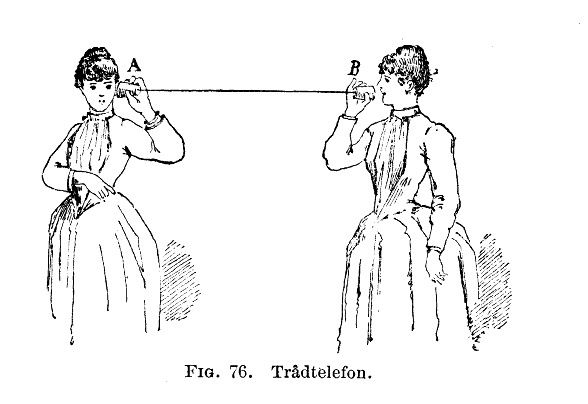 Were there telephones in our dorm rooms? Or pay phones in the halls? I can’t remember one way or the other. But somehow I’m hoping for more from Daughter. Maybe I’m just an over-involved 21st century yuppie parent. Maybe I’m used to having at least a partial sense of what she’s doing in school and with her friends. (For a teenager, she’s been pretty communicative.) Or maybe when you’re looking at tuition and room/board costs that top $60,000, you feel like you deserve something more than “Fine” every two or three weeks. It felt like the sound someone would make in a horror movie when the alien predator that they had assumed was lying dead in a pool of goo suddenly recomposes itself and resumes its attack. This feeds my suspicion that, with this generation, texting multiple times a day is less intrusive or threatening than a weekly phone call. It will be interesting to see what we manage to work out. How much bigger is an empty nest? All year I’ve been moaning in this blog about Daughter’s impending departure for college. Loss, separation, passage of time, reminder of mortality, and so on. But in fact, I also spend a fair amount of time thinking about all the things I’m going to do once she’s gone. I’m going to cook kid-unfriendly vegetables like kale and cauliflower and cabbage. I’m going to sign up for a boot-camp program at my gym from 6 to 7:15 on weekday mornings. I’ll go to movies. To synagogue. To First Friday art walks in Oakland. Sam and I will bike from winery to winery in Sonoma. 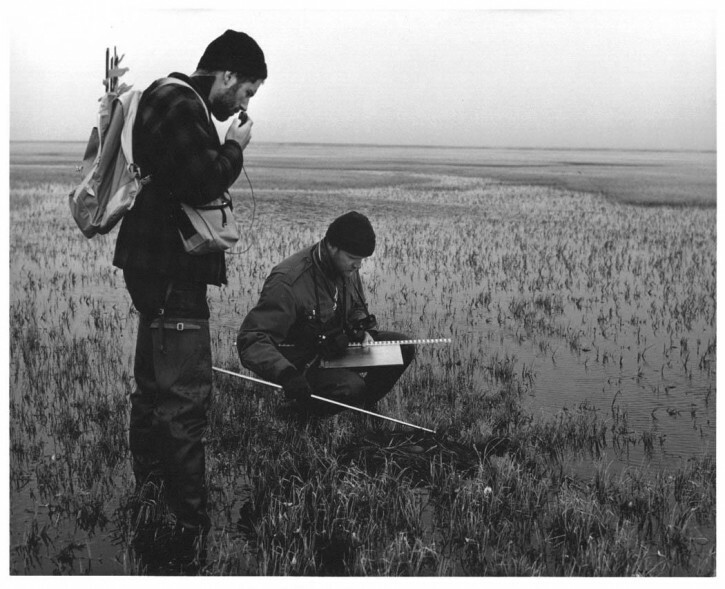 I’ll go on countless Audubon field trips…. Above all, I’ll return to revising my novel. I’ll work like a maniac, like life is one non-stop writers’ colony, and resolve all the plot and character problems, and bang that sucker out. I thought about it a lot this spring when I found myself the underachiever of my writing group, feeling guilty for not producing new drafts or rewrites: Just wait until September, then I will be amazingly productive…. It occurred to me the other day that September — the empty nest — has become an Emerald City. It’s shimmering in the distance at the end of the road. Magical things will happen. The Scarecrow will get his brains, the Tin Man his heart, the Lion his courage. Ilana will get the time and focus to finish her novel. So then I started to wonder, Just how much more time will I actually have? It’s not like Daughter is still four years old and needs me to play with her and bathe her and read stories at bedtime. In fact, most of the time she’s out with friends or in her room with the door closed. She makes her own lunches and does her own laundry. I don’t even need to drive her around anymore, since she got her license last month. Some days we hardly say twenty sentences to each other. How exactly is she keeping me from working on my novel? The critic in me says that she isn’t keeping me from the novel; I’m keeping myself. Revising is hard, I feel stuck on certain things, and she’s simply providing a good excuse not to deal with those challenges. I already have a relatively ideal situation for writing — a half-time job, and a beach house “retreat” that we share with friends and thus have access to every third week. Why aren’t I writing my little fingers off right now? But in fact, I do believe that having a child at home tends to consume one’s attention, even if that child is an independent teenager. Having a child — particularly for women, I think, but maybe for some men too — colonizes part of your brain like some alien Star Trek spore. A whole section of your brain is roped off with “seat taken” signs. When your child is nearby — even shut in her room texting friends — millions of your neurons are firing away non-stop on autopilot, vigilant for sounds of distress, sounds of happiness, sounds of misbehavior. When all this is going on, it is hard to summon up the level of concentration needed to work on a novel. I’ll feel free to spend four-day weekends at the beach house. With Daughter here, I don’t like to be away overnight. But once she’s gone, I can join Sam there on weekends and then remain there writing by myself on Mondays and Tuesdays. I’ll have uninterrupted early mornings. I can wake up at 6 a.m. and get right to work. No half-listening for sounds of showering, dressing etc. No need to remind anyone that they need to be out the door in ten minutes. No driving anyone to BART. By 9 a.m., I can have three hours of work under my belt. So yes, I think I will have more time for writing when she is gone. Or at least more focused time for writing. But still, I wonder if I am heaping too many expectations onto September. If I’m slipping into a bit of magical thinking. The Emerald City shimmered from a distance but the Wizard turned out to be an ordinary man with no special powers. How many ambitions can one empty nest hold? I’m walking around with quiet sadness as background music, with Daughter going off to college in less than one month. Then every so often — rarely, but still sometimes — something happens that makes me want to hurl her out the door with her suitcase flying behind her. Sam and I saw it on Broadway back in the 1980s, and for two decades I have continued singing the tunes. 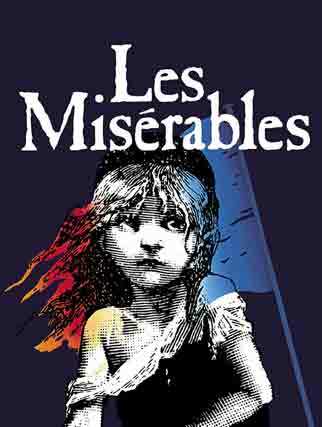 So when I heard last winter that Les Miz was coming to San Francisco, I rushed out — well, rushed to my computer, to be accurate — and bought tickets. For months I looked forward to this. I bought the soundtrack for my iPod. I borrowed the Victor Hugo novel from the library and read all 1,400 pages of it, adding forays into Wikipedia to try and puzzle out 19th century French politics. I imagined sitting with Daughter and Boyfriend at dinner before the show, summarizing the plot and the context for them so they would get the most out of it. Flash forward to night of show. Lovely dinner at a Brazilian restaurant near the theatre eating feijoada and balls of fried something-or-other. I offer to summarize the plot, only to hear, No! Don’t give it away! Earlier I had offered to share the soundtrack with her, only to hear, No! I don’t want to listen to it in advance! Why does this always seem to happen? Les Miz. The Threepenny Opera. Bruce Springsteen. Erich Fromm. The movie Reds. The movie Nashville. Casablanca. Or dinners that I look up in cookbooks, then carefully dice and blend and bake. It feels like I offer a small, carefully wrapped gift box to my child — a little gold box with a satin ribbon holding a part of my heart. And then she dismisses it with a toss of her head, or rolled eyes. Doesn’t want to bother with it. Or goes along but doesn’t get it. Doesn’t really care. And why does this push my buttons? There are many times that Sam hates a movie or book that I love, and it doesn’t frustrate me this way. But there’s a different emotional weight when it’s your child. You yearn to give them beauty, delight, joy. Isn’t it your job to show them the beauty in the world? And you try so hard! You plan! You care! You anticipate! And then it doesn’t work out. Okay, I know this is totally normal. Daughter will discover her own sources of beauty, delight and joy. Probably discovering them on her own — rather than being led to them by a parent — is part of the delight and joy. And she’s not ungrateful. She even thanked us for buying the tickets and dinner last night. In fact, when I consider things rationally, there are lots of times when she has appreciated some beloved cultural icon of mine — Phil Ochs, Leonard Cohen, Lord of the Rings, the BBC Pride and Prejudice, Esther Averill’s The Cat Club. Even Springsteen, a little. Still, who wants to be rational? On Thursday night, boy, was I ready to throw her out of the house. 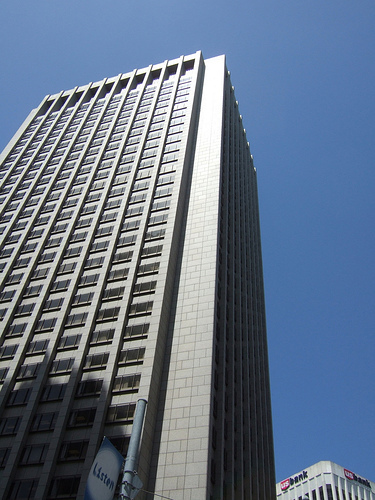 A Peregrine Falcon pair have been nesting and raising their young on the 33rd floor of the PG&E building in downtown San Francisco. I’ve written in my other blog for Golden Gate Audubon about the nest cam that let viewers watch the chicks on the Web, and the “fledge watch” volunteers who are monitoring and helping the young falcons as they master their flying. Here I wanted to write about their first flight. Think about it. Their nest is 33 floors up, over concrete streets and sidewalks. For the first month or so of their lives, the falcon chicks hang out on the building ledge while the parents fly to and fro bringing them food. They walk back and forth a bit, stretch their wings, flap a bit. Then one day they push off the ledge. Just like that, an unforgiving 33 floors up. We talk about our kids “leaving the nest” all the time in a figurative sense, but I’d never really thought about what this means literally for birds like those falcons. Human development seems so incremental and safe in comparison. Our infants start to move by crawling, pushing one arm up at a time. If it doesn’t work, so what? They collapse five inches onto the floor. When it’s time to stand, they pull themselves up on a coffee table or chair. They have something to hold on to. And if it doesn’t work, they plop right down on their fleshy bottoms. Even other birds have an easier first flight than those falcon fledgelings. Sam and I went to view Great Egret nests today at Audubon Canyon Ranch near our Stinson Beach house. There is a colony of dozens of egret nests high in a single tree, a kind of apartment complex of egrets. But the nests are resting above a thick canopy of branches and other trees, so if a fledge (first flight) goes wrong, the young bird only falls as far as the next set of branches. Not so for the falcons. But every time I drive with her I am terrified. Any single mis-step could bring disaster. Is she too close to the wall as we drive through a long tunnel? Is she going to pay attention and turn the wheel as we approach a curve on the freeway? There is this potential for disaster with any driver — cab drivers, bus drivers, friends of mine, even Sam. Once you get going fast enough, any mistake becomes the equivalent of a 33-floor drop. But I take safe outcomes for granted with most adult drivers and don’t picture imminent death in each freeway curve. With my daughter, though, I get terrified. I try not to show it. But I feel it. But even learning to drive is less all-or-nothing than a falcon fledge from a 33-floor skyscraper. Does the young bird realize what it is undertaking and what is at stake when it spreads its wings and pushes off from the ledge? 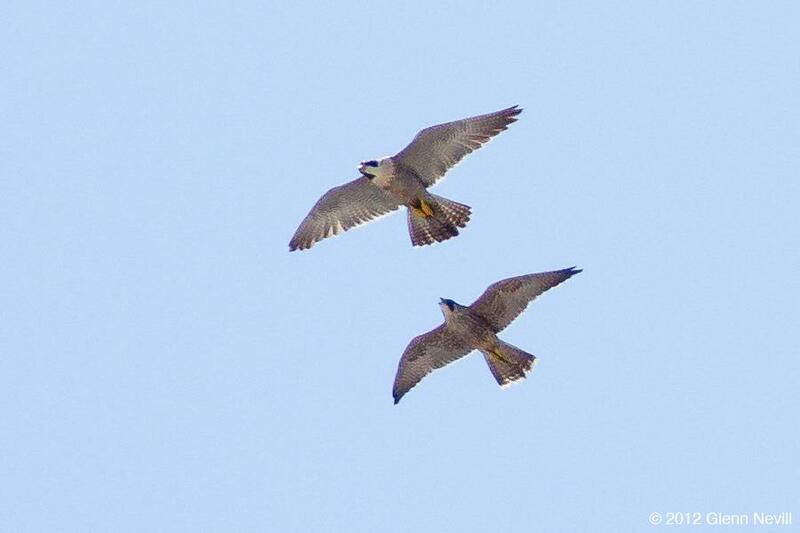 You can find more of Glenn’s falcon photos at http://raptor-gallery.com/2012_05_23/index.htm . This week it became apparent that the end had arrived for my 17-year-old Camry station wagon, the mommy car I bought when my daughter was 18 months old. The blog post seemed ready to write itself: Another sign of transition to en empty nest. Feelings of sadness, astonishment, mortality. Et cetera. But I feel like I’ve written this same post about a dozen times so far this year. First rule of blogging: Don’t be tedious or whiny. As a young adult, I fantasized about little flashy sports cars like the _________. As a good environmentalist, I drove little high-mileage cars like the __________. But when I became a parent, I needed a vehicle that was more ________. I envisioned ferrying bevies of children on field trips to _________ or camping trips to _________. With only one child, a minivan seemed like overkill. So we bought a white Camry station wagon, the kind with a back area that could be turned into two rear-facing seats to carry a total of seven passengers. It was huge. It was bulky. We nicknamed it the Great White ___________. The first few weeks when I looked at it in our driveway, I couldn’t believe who I had become. I was suddenly a suburban ___________. I wasn’t a person anymore, I was a Parent. And that felt so wrong! I was supposed to be someone who HAD Parents, not someone who WAS a parent. That big white stationwagon was a symbol of all the _______ I felt about the transition to parenthood. Then last week the computer that runs the _________ gave out. I was told it would cost $3000 to replace it. That crosses the border into “time-to-buy-a-new-car” land. And since B. is going off to college in four months, the next car won’t be a station wagon. It will be smaller. Probably a _______ or maybe a _________, since I remain the good environmentalist. I can’t help thinking that this is the first in a series of downsizings over the next couple of decades –- smaller car, smaller grocery bills, eventually a smaller house and someday leaving houses entirely for a _________. The parenting period of my life is ending. Even scarier, the expansion period of my life is ending. I don’t want to be morbid, and I know there are lots of upsides to this transition, but I still feel __________.